During the war Germany had carried out several successful operations using airborne troops. Prime Minister Winston Churchill asked for an airborne division to be formed. He wanted an airborne unit that could be dropped (parachuted), or landed (gliders) behind enemy lines to secure certain objectives during the war. In October of 1941, the 1st Airborne Division was formed. In April of 1943 a second Division was formed. This Division was named the 6th Airborne. The British only had 2 Divisions, the 1st and the 6th. There was no 2nd, 3rd, 4th and 5th divisions. This was a tactical move used to fool Germany into thinking that they had six full airborne divisions. The 6th airborne Division, under the command of Major General R.N Gale (pictured) was made up of 12,215 soldiers. 701 officers and 11,514 other ranks. The 9th Parachute Regiment (Battalion), under the command of Lt. 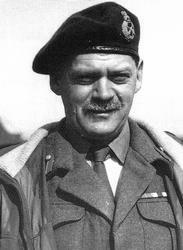 Colonel Terence Otway was a Regiment in the 6th Airborne. The 9th Para saw much fighting during the later part of the war. June 6th, 1944- D-Day. Operation Overlord. Troops dropped behind enemy lines to hold bridges, road crossings and destroy bunkers that could condemn the Normandy beach landings. March 24th, 1945 Operation Varsity. Paratroopers are dropped over the Rhine river. Even though the 6th Airborne Division was thanked by many for their heroic actions in the war, they were disbanded in May, 1948. WE MAKE SURE EVERYONE KNOWS WHO THEY WERE!! For more information, including the battles the para were involved in, click here.